Movie: "Mary Queen of Scots"
Queen Mary of Scotland returns home and begins making moves to have herself and her descendants declared heir to the throne of the British Empire. 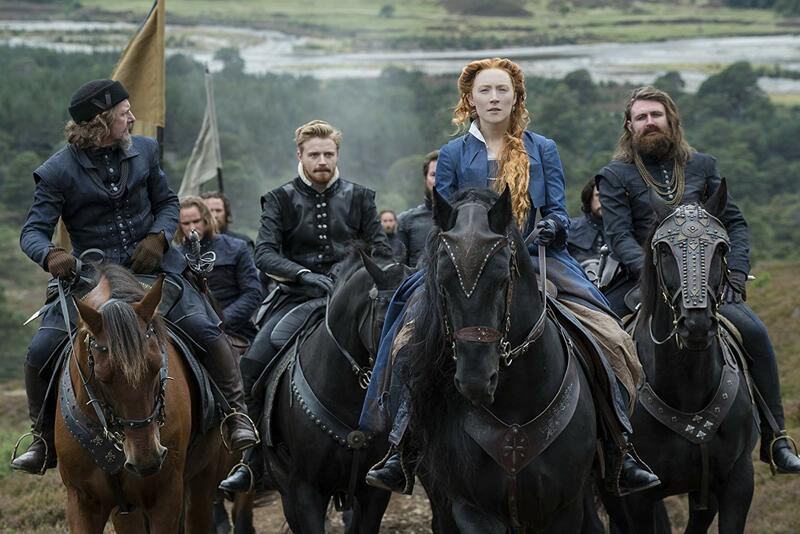 Politics, religion, and power struggle is the name of the game in director Josie Rourke's debut film "Mary Queen of Scots." The film is based on the book "Queen of Scots: The True Life of Mary Stuart" by John Guy with a script written by Beau Willimon, who is best known for his Oscar-nominated screenplay "The Ides of March." After the death of her husband the King Francis II of France, Mary Stuart (Saoirse Ronan) returns home to Scotland to reclaim her rightful throne. Once there, she begins to position herself to be declared heir to the throne of England as she is the cousin of Queen Elizabeth (Margot Robbie). However, many don't want this to happen since Mary Stuart is Catholic. Protestantism is the ruling religion in England and is on the rise in Scotland, so high ranking Protestants are willing to do whatever they can to make sure a papist never sits on the throne of England again. 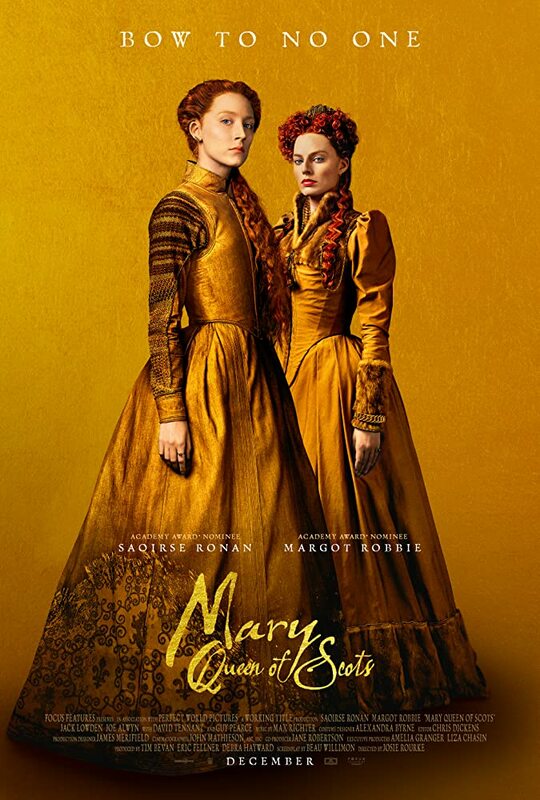 We had high hopes for "Mary Queen of Scots" after seeing its trailer, and especially considering it stars Saoirse Ronan and Margot Robbie, two of Hollywood's most talented young actresses. The best part of this film is the marvelous, elaborate, absolutely stunning costume design by Alexandra Byrne, which captures the Elizabethan era beautifully. The same can be said about the remarkable hair and makeup work by Jenny Shircore, Marc Pilcher, and Jessica Brooks. Both the costume designers and makeup team earned a much-deserved Academy Award nomination for their work on this movie. John Mathieson's expert cinematography is also quite excellent. Unfortunately, the rest of it doesn't quite live up to its visual aesthetic. There is something about this story that feels a touch flat and lifeless. It doesn't flow very well, and time frequently jumps years in the future without a moment's notice. It also doesn't help that this film was marketed as an epic showdown between two powerful women but actually turned out to be little more than a display of how these two women in prominent positions of power were manipulated and ultimately undone by the men that surrounded them. We were expecting something grand and intense and fierce, but it's never anywhere close to it. We may have been a little more forgiving if had been exciting and/or more entertaining at any other point, but more often than not, we found ourselves underwhelmed by what we were watching. That being said, Saoirse Ronan and Margot Robbie do manage to give two great performances and rise far above the material they were given. Despite some admirable performances and a gorgeous visual aesthetic, "Mary Queen of Scots" was a rather mundane, forgettable letdown.